GO PRO! Become a PADI Open Water Scuba Instructor in Taormina, Sicily, Italy! Ever thought about teaching people all about your passion? Teach people how to dive? Than it is time to become a PADI Open Water Scuba Instructor. Being a PADI Dive Instructor is a great career. Dive Careers Europe gives to the chance to make it a reality. Dive Careers Europe is created in cooperation with Sea Spirit Diving Resort and Dive-Careers.com. Getting your certification with Dive Careers Europe will give you the opportunity to work all around the world! 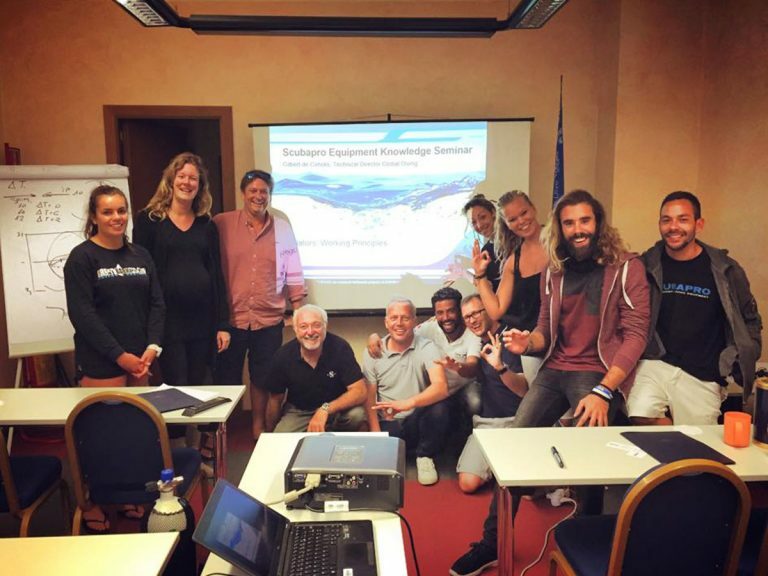 The IDC will be conducted by the Dive-Careers-Europe Team, existing of PADI Course Director Carmelo Sgroi (Owner of Sea Spirit Diving Resort) and PADI IDC Staff Instructor Cilla Lentz. The pre-IDC. This is the time to get an idea about your demonstration skills and your knowledge about the dive-theory. Together we will look what you already know about the different topics of the dive theory: Physics, Physiology, Decompression Theory, Equipment and Skills and Environment. Also we will have a look to the PADI General Standards & Procedures. In the water we will do a Skill Circuit which includes all the demonstration skills of the Open Water Diver Course. It is a great time to get to know each other! Our Pre-IDC in Taormina, Sicily, will give you that extra experience before you start the IDC, focusing on the parts of the different PADI Courses while assisting an experienced PADI Instructor and practicing your demonstration skills that will come from completing your training at one of the most vibrant, successful dive centers in the world. The Pre-IDC in Sicily starts in the beginning of April and beginning of October at Sea Spirit Diving Resort. The best way to get yourself ready for the IDC. Now it really starts! For 10 days we will be focused on everything you need to know and need to learn to become the best Diving Instructor. We will be practising Academic Presentations, so you know how to teach in the classroom. Furthermore we will be a lot in the water, doing Confined Water Presentations and Open Water Presentations. We will teach you the structure so you can teach your students in the best way how to learn diving. We will repeat all the presentations several times and each time you will be evaluated by our Course Director. Another important part of the IDC is the PADI Instructor Manual where all the standards are explained. As an instructor you will use this Instructor Manual to organise your courses so we will teach you how to use it in the most optimal manner and how to find the right information. After the IDC, you will be ready for the PADI Instructor Examination. 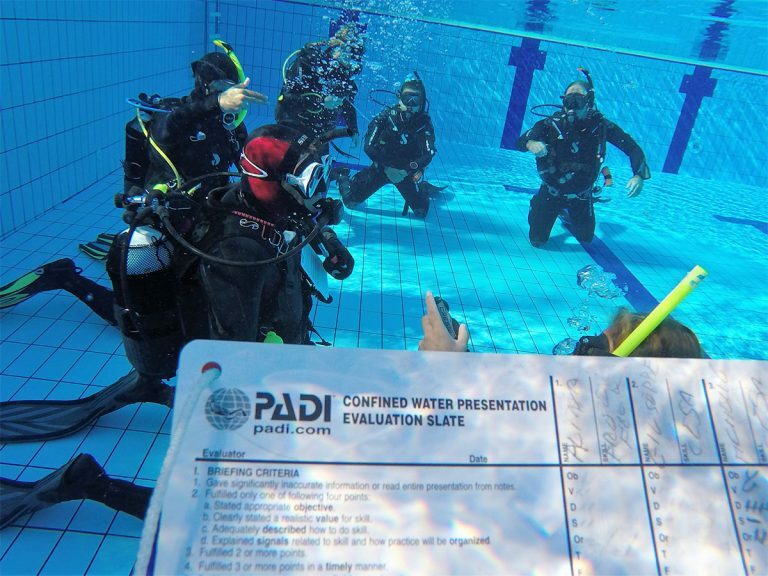 During 2 days, PADI Examiners will evaluate on all the presentations we have been practising during the IDC and there will be a Theory Exam (Physics, Physiology, Decompression Theory, Skills and Environment and Equipment) and the General Standards & Procedures Exam. During the IDC, we will also do the Emergency First Responder Instructor Course. A big plus in your career because with this certification you are able to teach EFR to your students before they do the Rescue Course. 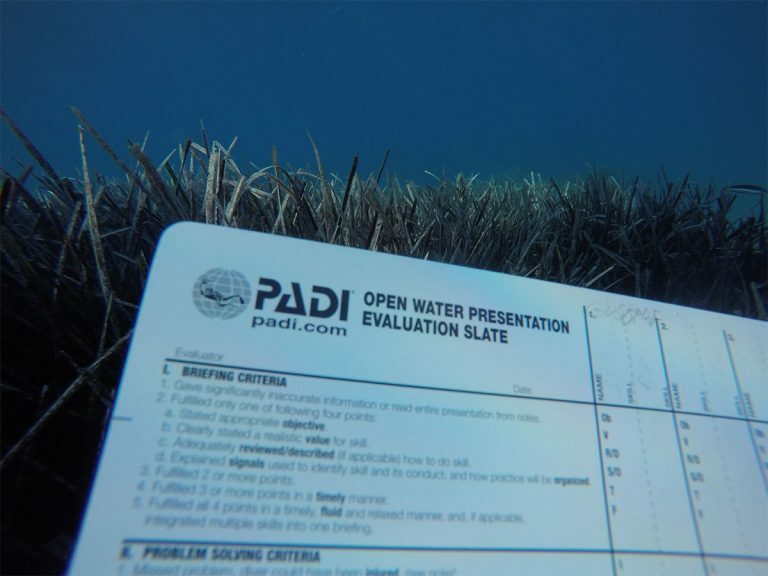 The requirements are that you need to be already certified as a Dive Master (or the equivalent), have at least 60 logged dives (100 before you get to the Instructor Exam). Also, you must have been certified as a diver (open water or equivalent) for at least 6 months. You also must have proof of CPR and First Aid training within the last 12 months, be fit for diving and submit a Medcial Statement signed by a physician within the last 12 months. Why should you choose to do your PADI Instructor Development Course in Taormina, Sicily? Because it leads you to numerous advantages during the IDC with Carmelo Sgroi, which will be conducted in an international setting, loads of possibilities onwards and an unforgettable experience on one of the most beautiful island in the Mediterranean Sea, Sicily! The IDC will be conducted by PADI Course Director Carmelo Sgroi from dive-careers.com. Carmelo is the owner of Sea Spirit, with loads of experience in teaching diving on a professional level, leading the PADI Divemaster Program at Sea Spirit in Taormina and assisting Mark Soworka for years during the IDCs on Koh Tao and Sicily. Besides being an experienced recreational diver, he is also a PADI Tec Instructor to deepen your knowledge about scuba diving even more! Together with Cilla Lentz (PADI IDC Staff Instructor) they can provide the IDC in three languages: English, Italian and Dutch. Also they will bring their experience of the local area into the IDC so you will get the best possible information and experience from different diving perspectives. This IDC will be organized by us in Taormina. At Sea Spirit we guarantee a high service-level by providing a big classroom in the UNAhotel Naxos Beach, where academic presentations will take place, an Olympic swimming pool for the confined water sessions, a dedicated 8-meter Zodiac during the IDC with all comforts during the open water session. 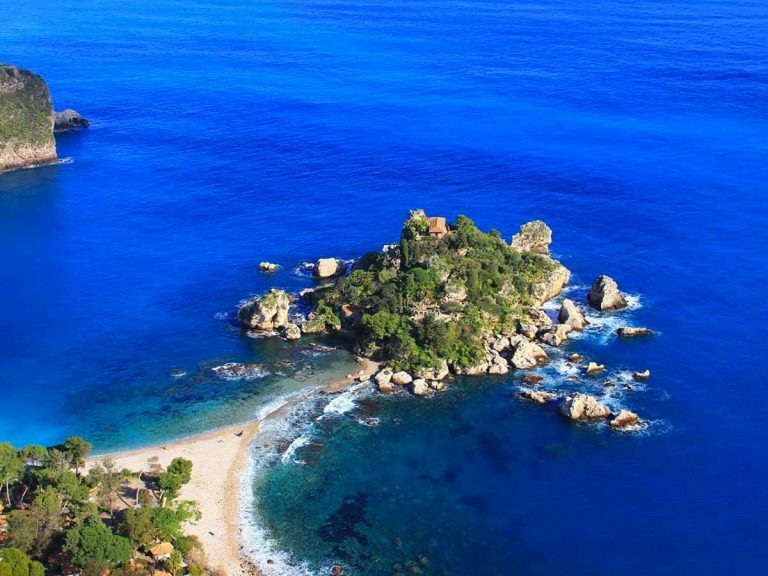 As a bonus, the open water sessions will be held at the famous Isola Bella Marine Park in Taormina where together we can discover the under-water-world of the Mediterranean Sea! Of course last but not least, think again, you will be doing your IDC in SICILY! : the island of sunshine, fascinating nature, a wealth of history and the finest food in the world! 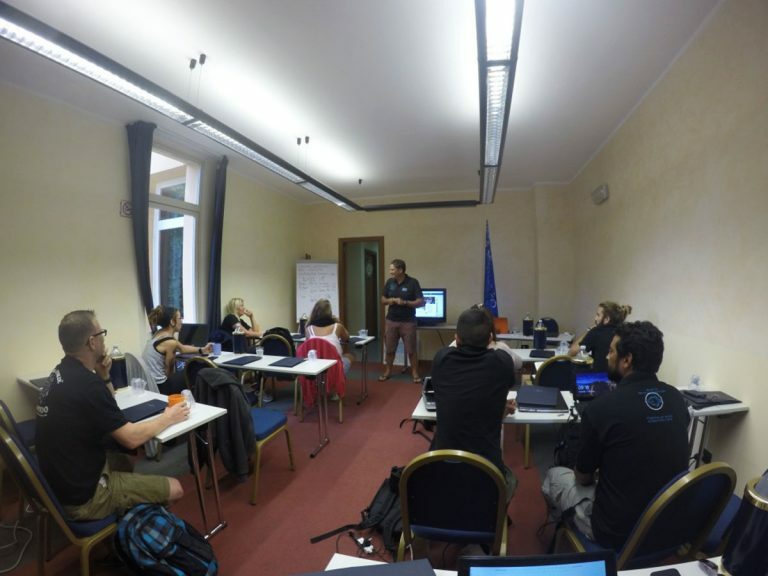 Don’t forget, Dive Careers Europe allows you access to that network of successful dive centers, through one of Mark Soworka’s Dive Instructor internships. The PADI Instructor Development Programma is developed by Mark Soworka, one of the most successful instructor trainers around and guarantees you a 100% success for the instructor exam. Dive Careers Europe gives you the opportunity to work around the world through our network in: Thailand, Sri Lanka, India, The Philippines, Indonesia, Australia and Italy. For our other worldwide opportunities for becoming a PADI Open Water Scuba Instructor, have a look at the dates of the other IDCs, organized by Dive-Careers.com. When signing up for the IDC, you will be personally guided by one of our PADI Course Directors or PADI IDC Staff Instructors for all your questions and help with organizing your IDC the best way possible. Also Crossovers to PADI are possible! Dive Careers Europe also helps you to find a suitable accommodation for you during the Instructor Development Internship and the IDC. Want to continue your education and start to travel around the world? Look for our possibilities at the Master Scuba Diver Trainer! IDC + EFR Instructor: €1600 (all PADI materials included, excl. PADI fees). IDC + EFR Instructor Cross-over €1350 (all PADI materials included, excl. PADI fees). Only valid when passed the entry-exam to enter the IDC Cross-over: Theory (Physics, Physiology, RDP, Equipment, Environment), 12 Questions per theme (score 75% to pass) and PADI Standard & Procedures 50 Questions (score 75% to pass). One specialty is included in the price: ‘O2 Emergency Provider’, for other specialties, the price is €99.00 + €37.50 excl. VAT PADI fees. With 5 specialties and 25 PADI certifications it can be requested directly from PADI to become MSDT. A SCUBAPRO Equipment Workshop and Marine Reef Ecology Resource Management Seminar are added as an extra to the IDC Program for free. Our dive resort in Taormina, Sicily has all comforts, we have an Olympic pool of 50 meters for demonstrations of confined water with bathrooms and showers, a conference room for academic presentations, two diving zodiacs and an 8-seats minibus for transfers.